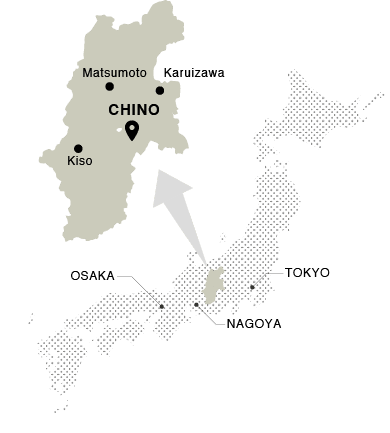 Chino is located on the Eastern side of Nagano prefecture, about 2h from Tokyo and 30min from Matsumoto. Stretching from the peaks of the Yatsugatake all the way down to where Suwa Valley begins, the entire area is perched on the foothills of a grand mountain range where people have lived uninterruptedly for over 10,000 years. Chino is made up of 4 areas. There is the quasi-national park, formed by the many peaks of the Yatsugatake; the highland thermal retreat in Tateshina; the mountain resorts of Lake Shirakaba and Kurumayama; and the town and rural villages scattered on the foothills, where the locals keep traditions alive. A sanctuary of relaxation since old, over 6 types of hot springs flow in this quiet oasis immersed in nature. A paradise for outdoor lovers where you can hike, jog, cycle, canoe, ski and more at over 1400m. A long-extinct volcano, the Yatsugatake from its almost 3,000m offers trekkers great views of Mt.Fuji and the Alps. A site of peaceful hamlets stilled in time, ancient shrines and elegant artifacts dating back thousands of years.